September is busy, mostly in a good way. This evening is the first chance I’ve had to stop and write anything down for a while. But for once I have some rather good excuses. First, my story ‘The Springwood Shelter for Genetically Modified Animals‘ was published in Crossed Genres, along with their interview with me. Needless to say, I was pretty smiley about this! Next Mr J and I flew out to BC for his family reunion. For me there was no ‘re’ as this was my first time to meet many of his extended family. They were incredibly welcoming, kind, and fun! Much Sushi-Go was played, until the word sushi lost/gained all meaning. We flew back on the red-eye, went to work, and greeted my parents and God-Father that evening. It was their first time in Ottawa. We’ve been showing them around / being impressed at their tourist powers to see things we never do. Something you don’t want to do right before getting married is have a sick cat. John Montague, the 4th Earl of Sandwich, became very ill two days before our wedding. We rushed him to the vet on Wednesday night. Thankfully, it looks like he’ll be fine after a stay at the vet and some undignified procedures. My first fiction sale really came in at the right time as it went towards partly paying Monty’s emergency medical bills. Monty also had impeccable timing, getting sick just before Mr J’s and my wedding, but thankfully not during. He was able to perform his duties as Best Man (Cat) remotely from home. Monty was chosen as he already had his own tuxedo. 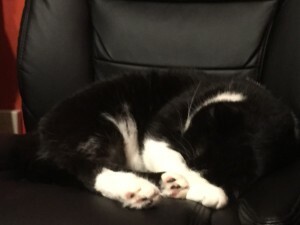 Right now he is curled up on a chair as if nothing ever happened. Speaking of the wedding, Mr J and I got married! I suppose I should be calling him Mr J-L from now on! We’ve combined our names. Apologies to any future children who struggle to spell their ridiculously long moniker! I will still be publishing under Verity Lane though, I think. I won’t be sharing much about the wedding, except to say that I’m so happy! I felt and still feel like I’m riding a wave of happiness. I’ve always had a strong sense of when something will be a good path to take. This path gives me that feeling, and I’ll be holding hands with a most wonderful person as I walk down it. That’s pretty soppy, I should probably stop before I turn into a Hallmark Card factory. I’m not sure when I’ll get a chance to blog again soon. September doesn’t get any calmer from here! Previous Post And there was much celebrating!